After weighing their market options, the Atlanta Braves elected to get the band back together for another album. The Braves enter spring training carrying an identical starting outfield after re-signing 2018 All-Star Nick Markakis to once again partner with Ender Inciarte, winner of three consecutive Gold Gloves in center field, and National League Rookie of the Year Ronald Acuña Jr. Toss in power-hitting Adam Duvall — last summer’s trade-deadline acquisition who missed the postseason roster — and Atlanta’s outfield mix will pick up right where it left off. 1. 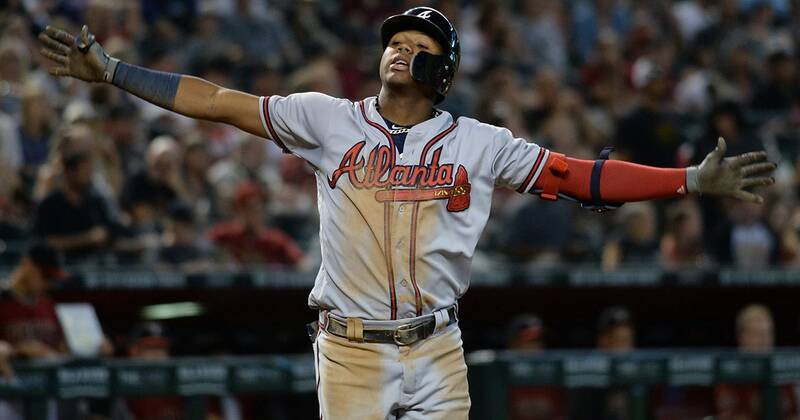 Will Ronald Acuña Jr. ascend from 20-year-old star to MVP candidate in Year 2? In this digital and social age, it’s becoming exceedingly difficult to surpass hype. Ronald Acuña Jr. found a way — a player dubbed The Next Big Thing seemingly hellbent on becoming The Current Big Thing. At 20 years old, the Venezuelan wunderkind overcame a slow start in the minors and a scary knee injury at Fenway Park to become one of baseball’s scariest hitters in the second half, slashing .293/.366/.552 with 26 home runs in 487 plate appearances. Only 14 players hit at least 40 percent above league average in 450 or more plate appearances last season and, sure enough, the rookie phenom joined elite company while terrorizing the base paths and logging three outs above average in the field. If Acuña keeps up his rookie pace, he’s bound for a five-win season at worst, solidifying himself as a top-20 position player at just 21 years old. Sophomore slumps, season-long adjustments to major-league pitching, good health, team success — a player does not compete in a vacuum and a variety of challenges will be on the table in 2019. But If he gets better, as he showed in the second half by trailing only NL MVP Christian Yelich and Justin Turner in offensive production in the National League, Acuña could challenge Vida Blue’s 48-year-old record of the youngest MVP in the sport’s history. He’s that good. 2. What does Nick Markakis have in store for his All-Star encore? Nick Markakis’ 2018 season shattered realistic expectations. The owner of more than 2,000 career hits entered the final year of his initial four-year contract with Atlanta appearing to slow down, hitting below league for two consecutive years (99 weighted runs created in his first three seasons with the Braves, a tick below the MLB average) entering his age-34 campaign. All he did was respond by making his first career All-Star appearance and unexpectedly capturing Gold Glove and Silver Slugger Awards, the quintessential contract year for a veteran player. Unfortunately for Markakis, his timing did not correlate with a bull market for players. He returns to the Braves at the bargain-basement price of $4 million for the 2019 season plus a 2020 club option, rounding out Atlanta’s lineup with a consistent-contact lefty bat behind the roster’s dynamic trio of Acuña, Josh Donaldson and Freddie Freeman. So which version of Markakis do the Braves get this season? The truth is likely somewhere in the middle, though the Braves front office says they will try to maximize Markakis’ abilities through more rest after playing 162 games last season, nodding to a fatigue factor that resulted in a second-half decline. 3. How will the Braves utilize their backup outfield options? The answer to this question is a spring training wildcard. Adam Duvall returns to the fold alongside utility options Johan Camargo and Charlie Culberson. Top position prospect Austin Riley, whose future remains at third base, is expected to get outfield reps in camp. The free-agent market is wide open. The Braves have not parted with a single top prospect via trade. Roster cuts create opportunities every spring — as evidenced by the Braves’ 2018 Opening Day roster featuring late signings Peter Bourjos and Ryan Flaherty and Anibal Sanchez establishing himself enough to get the NLDS Game 2 nod in Los Angeles. There’s no way around the fact that Duvall’s short stint in Atlanta was a disaster, but spring training will allow him to reestablish himself as a 30-year-old player one season removed from back-to-back 30-homer efforts, Gold Glove-caliber defense and the ability to hit left-handers well. Even if he’s able to return to form in Orlando, though, Camargo’s move to the team’s utility role — a role Culberson thrived in last season — gives Atlanta two pieces in need of playing time if they play at their 2018 levels. Baseball presents few certainties, but a few players present an extremely high probability of consistency: Injuries notwithstanding, Mike Trout’s OPS will hover around 1.000, Max Scherzer will strike out at least 250 hitters and Nolan Arenado will slug .550 yet again. Based on recent defensive performance, Ender Inciarte’s glove belongs on that list. The three-time Gold Glove winner’s 63 outs above average rank first among outfielders in the Statcast Era (since 2016), but it’s also the way he’s reached that mark: Tallying exactly 21 outs above average every season for three years. Defensive metrics tend to vary. Ender Inciarte’s refuse to cooperate. Inciarte’s fielding talent at a premium position and his athletic ability continue to give him a very high floor at the major-league level, and if he can push his on-base percentage back up around the .350 mark — after sitting at .325 last year despite a good second half — the Braves will likely see yet another 10-homer, 20-steal, 3-WAR and, apparently, 21-OAA season from the 28-year-old outfielder. .550: The only four players in baseball history have slugged .550 or better before turning 21 years old? Hall of Famers Ted Williams and Frank Robinson, Alex Rodriguez and Ronald Acuña Jr.
2,237: Nick Markakis enters his 14th season ranked fifth in active hits behind Ichiro Suzuki, Albert Pujols, Miguel Cabrera and Robinson Cano. 8.6: The Braves’ youngest player’s numbers were not a fluke. Per Statcast, Acuña averaged a barrel every 8.6 plate appearances — ranking 11th in baseball, directly behind Christian Yelich and Javy Baez, among players with 300-plus batted ball events.